I spent this afternoon shooting and snowshoeing in Mosinee at River Park. Even in Winter, this place has an up north feel to it. It was the first day in which we had real snow in Wisconsin thick enough to snow show. The mist in the air added my desire to get out and shoot. To get the snow on the trees before it either falls or is blown off. Fog and mist may not be suitable for Country, but I could not resist to spend some time in this special place. This afternoon, after seeing a prompt for downloads from Nikon for Capture NX2, I decided to take a shot at Color Efex 3.0. 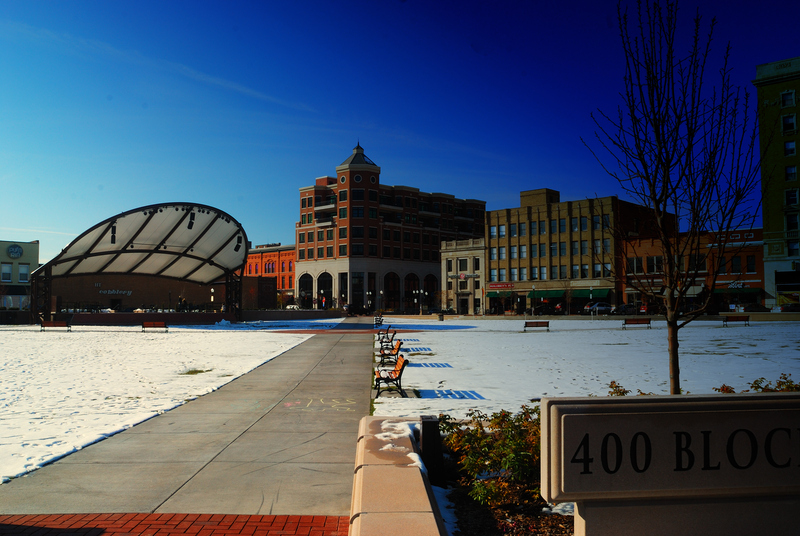 Take a look at this already strong image of downtown Wausau’s 400 Block taken on a Saturday in early December of 2011. I was able to add more brilliance and put in a graduated filter effect resulting in the crisper color of the scene. As I had put Color Efex to work, my eyes opened wider and my heart began to beat a little faster. The red brick of the buildings, the gradient blue of the sky, and the over all brilliance of the image make me feel good about this. I have already sent an image file to Dawn Follendorf of Wausau Mainstreet, and Tracy Balz of the Wausau/Central Wisconsin Visitor’s Bureau for a user-end review. Color Efex is capable of doing more wilder things. It could even lead into High Dynamic Range Photography. I have it on a 30 day free trial during which time I will continue to experiment with it. Last fall, the City of Wausau opened up a new section of the River’s Edge Walkway this time on the northwest side. This section has already become popular with joggers and walkers alike. Though it passes Beloit-Regal (Marathon Electric) it is somewhat separated from the noise of industry by white pines. 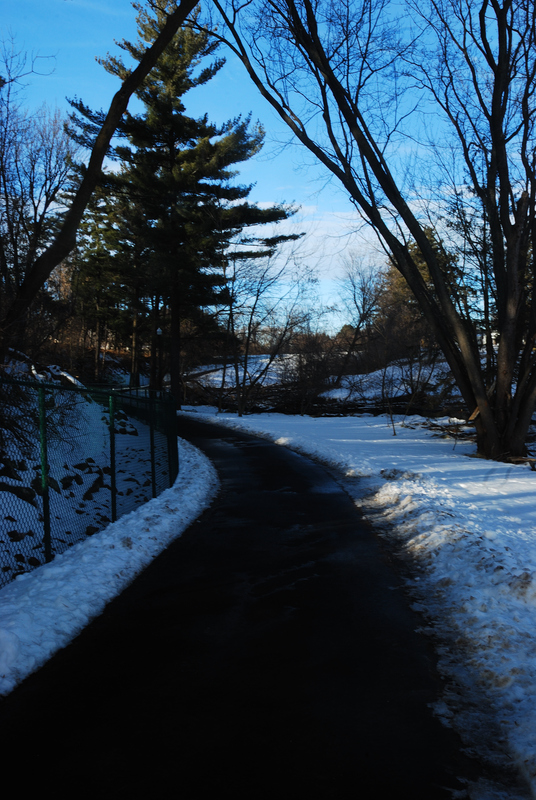 The trail”s gentle curves follow the river down to Knox Street from its confluence with Bos Creek at Schofield Park. 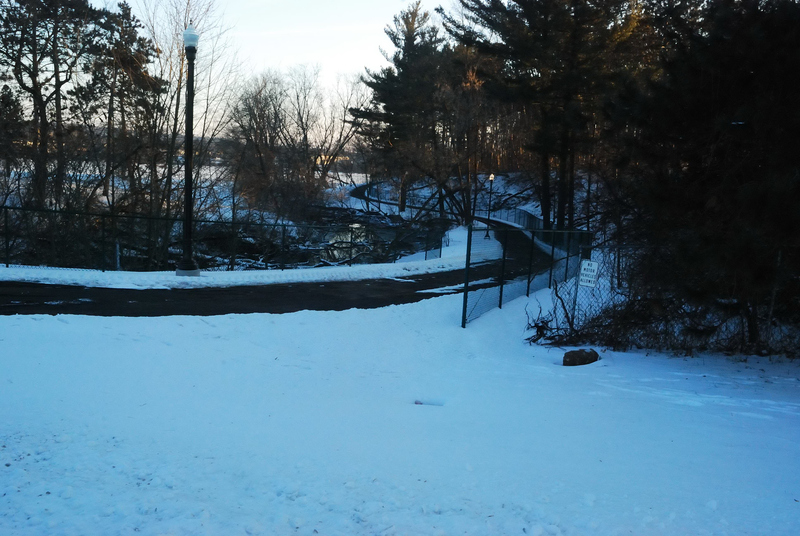 It is just one more step towards full-filling the dream of Wausau’s River Edge Commission of completing a walkway running the length of the Wisconsin River on both sides through the city. This greatly adds to the quality of life here in Wausau by making the river as much publicly accessible as possible. What was once sadly called “the nation’s hardest working sewer” is there for all to enjoy. As the trail curves up and away from the river at its northern end at Randolph Street and Burek Avenue near Schofield Park, you can hear a gurgling noise. Even in winter, small streams like Bos Creek rarely freeze over. Even in a city, there can be places where nature is free to give us the best and most peaceful of places. Now that spring has come, I continue to walk this trail, and it has become very popular, especially with 50 something adults. It is a quiet walk despite the low pounding sounds from Regal-Beloit’s (Marathon Electric) foundry. The company seems to be working to improve their share of the riverfront near the walkway. It is a shining example of how industry can work with the River’s Edge Commission. Other industries along the riverfront would, indeed, do well to follow. A big part of what sells a community is in how industry treats the environment around their facilities. Aesthetics can mean a lot to the company as a good corporate citizen.